When is an asset not an asset…….when you make it a liability! Well dear readers, what do you make of this? Today at 11:57 | Interfax-Ukraine Ukrainian Prime Minister and presidential candidate Yulia Tymoshenko has vowed not to allow the establishment of an international consortium on the basis of the Ukrainian gas transportation system. “When you hear the word consortium, this in fact means the merger of our state property [with foreign property], this in fact means Ukraine’s parting with it, and therefore I will not seek compromises here. The gas transportation system is Ukraine’s strategic state property, and I will not allow any machinations, like consortiums, joint ventures, or any kind of lease,” Tymoshenko said in a program broadcast on the Inter television channel. “As a matter of fact, Ukraine’s gas transportation system, which is state property, is our key to the state’s energy independence, this is our influence on all energy processes in our region, this is Ukraine’s influence on the European Union’s and the CIS countries’ energy policies, and this is our key strategic property,” Tymoshenko said. One has to ask several direct questions about this statement. If there is not going to be an international consortium made up of Ukraine, Russia and the EU to repair and maintain a gas transport system which has been completely ignored since 1991 and Ukrainian independence and has fallen into a state of disrepair…….where will Ukraine find the money from to make the necessary upgrades to the system? As the transit of gas across Ukraine has become a political pawn between Russia, Ukraine and the EU with results which have severely annoyed both Russia and the EU, would it not make sense to have a consortium of all interested partners which would insure they continued to use the existing system to some degree? Only last week Hungarian banks signed up to the joint venture for a direct line from Russia to Italy called the Southstream pipeline which completely avoids Ukraine. There is only geological seabed surveys stopping this happening. Germany has already done the deal with Russia for a direct line through the sea and has all the persmissions from other nations for this pipeline to go through their waters. Geological and seabed surveys are complete. The Nordstream pipeline will begin being layed on the seabed in the next few months. All joint venture parteners are signed and sealed. This pipeline will happen avoiding Ukraine. Why is it that Germany and Italy, two of the EU’s major players have sought to secure their own direct lines from Russia to their nations completely avoiding Ukraine? Part of the answer lays in jobs of course as both EU nations have partners involved in the projects, but let us be honest here, it is not because of the antiquated and leaking existing pipeline running through Ukraine, but that Ukraine cannot be trusted as a transit country. Both Nordstream and Southstream will be in existance by 2012/13. There is nothing to stop either Italy or Germany from then being central nodes for these lines to connect to all the other nations which make up the EU. It may well be that Ms Tymoshenko is already aware that there will be no international consortium to get involved with the Ukrainian gas transit system as nobody will be bloody using it and therefore she is trying to appear patriotic by stating she will not allow anyone to be involved…..when really nobody wants to be involved as both Nord and Southstream projects will go ahead. What benefit is there to keeping 100% hold of an assest which nobody will use in the future? It will do nothing to influence energy politics in the region if there is no bloody gas going through it other than for Ukrainian domestic use. Who is she trying to kid?……..Don’t answer that, it was a rhetorical question, obviously she is tyring to kid voters that what could have been a strategic asset if Ukraine had not been so unreliable as a partner…..is still going to be an asset in the long term future…..which now it will not be. Ukraine has turned it’s existing energy asset into a liability of major proportions for both Russia and the EU……to the point that both are now definitely going to bypass that liability. The only prospect of keeping the Ukrainian gas transportaion system an asset to Ukraine (disregarding the costs) is to allow the major stakeholders……Russia and the EU…….a stake in the system and some form of control over it because Ukraine alone has proved to be unreliable. Where is Ukraine going to find the money to drill for oil on the Black Sea shelf or tap it’s own natural gas if it loses the revenue from transporting Russian gas? Surely not from outside soucres…..for this would be…..well….. an international consortium having a stake in Ukrainian energy….. which Ms Tymoshenko is against. Apart from internal distribution of self sourced gas and oil reserves should Ukraine find the money to do it alone…..there is no use for the existing lines if the EU and Russia are no longer using them……..and then Ukraine still has to fix all the leaks in it’s existing transit system…..and upgrade it at additional cost due to lack of investment and maintenance over the past 20 years…….on top of the exploration and production costs. Where does that money come from? Ukraine in the past 5 years has managed to make it’s only existing energy asset into a complete liability and yet still Ms Tymoshenko is defending it as a jewel in the crown of Ukraine on the pretext Ukraine will still be important to either Russia or the EU when alternative routes are up and running! Interesting article and probably not that far from the truth if Ms Tymoshenko wins. I’m so glad I have friends in both Tymoshenko and PoR camps. Today at 16:21 | Interfax-Ukraine Ukraine has managed to set a standard of holding transparent and democratic election in Eastern Europe, which will visibly bolster Ukraine’s position in further strengthening of relations with the European Union, British Minister for Europe Chris Bryant, German State Minister of Foreign Affairs Werner Hoyer, Poland’s minister of European affairs Mikołaj Dowgielewicz and French Secretary of State for European Affairs Pierre Lellouche said in an article published in the Dzerkalo Tyzhnia (Mirror Weekly) newspaper on Saturday. “After several free and fair elections held over the previous five years, Ukraine set a standard for the holding of elections in Eastern Europe,” the ministers said in the article. They said that the sticking to the democratic line means the further reinforcement of relations between Ukraine and the European Union. “Ukraine, which will be able to continue consolidation of democracy and pluralism in the mass media, will be an example for other countries in the region,” the ministers said. Well those will be the famous last words. The only reason there was no shenanigans in the first round was that those who had the power, influence and money to pull off such shenanigans were already guaranteed to get through. There was never any doubt that Ms Tymoshenko and Mr Yanukovych would face each other in the final round of voting unless you live on a different planet or were suffering the effects of mind-bending drugs. Nobody else stood a chance of getting into the second round……if there had been, then there would have been shenanigans in the first round. Such statements really should have been reserved until after the second round of voting where there will undoubtedly not only be some shenanigans……and how foreign obsverers will know whether a Ukrainian is voting for candidate A or B because if they don’t they lose their job I have no idea……but a bitter and protracted battle over the result as things stand today. If this was not the case, the shinanigans over who is controlling the Internal Ministry (judges and police) would not have already started with 8 days to go before the election. Who wins this election will be the one which controls the Internal Ministry and the CEC if the result is close enough to challenge…….and less than 7% between them will trigger challenges I would imagine. If the winner or loser by vote count control these two organs they will win…..regardless of the vote count as they will be able to dictate the outcome of any court challenge, pure and simple. I am fairly sure that what is probably about to come, on, after and for a period of months thereafter, is not going to meet a single word in the jointly crafted statement of the EU politicians regarding Ukraine being a beacon of democratic process at all. I would be very pleased if these EU politicians turn out to be right……but as any one knows who lives or deals with Ukraine, it is not over until it is over……and then 1 month after it is over you still have to reassure yourself it is over. Yesterday at 22:17 | Interfax-Ukraine Tiraspol will not interfere in the demarcation of the Transdniestrian section of the Ukrainian-Moldovan border, said the Foreign Ministry of the self-proclaimed republic Transdniestria. “Desiring to strengthen good-neighborly relations with Ukraine, Transdniestria decided not to impede the demarcation work,” reads the statement by the Transdniestrian Foreign Ministry. In response, the Ukrainian government offered guarantees that the demarcation personnel would stay on Ukrainian territory and would not cross the frontier into the breakaway province, which styles itself on the Transdniestrian Moldovan Republic, the ministry said in a statement. “Unfortunately, Transdniestria has been denied the opportunity of equal participation in the demarcation work at any level in view of the absence of a clear mechanism of guaranteed equal representation for the Transdniestrian Moldovan Republic in relevant formats and mechanisms. Repeated proposals for developing such a mechanism remain without a response,” the statement said. 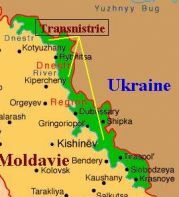 Earlier, Transdniestria said it would not allow Moldovan frontier demarcation personnel onto its territory. Ukraine and Moldova reportedly embarked on their final stage of demarcation on Friday. I have to say, I would not have been quick to give such guarantees…….it’s quite easily done crossing a border accidently…..or otherwise. Before the days when SatNav was so easily available, on several occasions I found myself “just” outside Belize or “just” inside Eire etc etc whilst on HM Service. Maybe a reassurance that no intentional transgressions would have been more appropriate? Well, you know I predicted chaos as the election result……..
Well dear readers, as you will know from a previous post last week I predicted chaos as the likely victor in the Ukrainian elections. Today at 12:32 | Ukrainian News The Internal Troops of the Internal Affairs Ministry have taken the Ukraina printing and publishing house, which prints ballot papers for the presidential elections, under protection, head of the press service of the Main department of the Internal Affairs Ministry’s Internal Troops, Svitlana Pavlovska, said. The militaries of the Internal Troops took the duty at 10:00 am, Jan. 28. Pavlovska said that the militarily to protect the enterprise, have passed considerable training. As reported, President Victor Yushchenko has urged the Internal Affairs Ministry to provide protection of the Ukraina printing and publishing house. Why has this been done?…….Because of a running battle between supporters of Yanukovych and Tymoshenko coming to blows and hurling smoke grenades……or tear gas……depending on whose version of events you want to believe…….trying to gain control of the building where the election ballot papers are generated! Add this to the “coup” of dismissing Luzenko as Interior Minsiter by one party……then him being appointed First Deputy Minister to that department and therefore continuing to run it in the absense of a Minister by the other…….. and the shenanigans and violence are just beginning. “Chaos” will be most definitely be the winner of this election now and any result will be subjected to long drawn out battles in the courts………this much is as certain as me drinking green tea tomorrow……which is all but guaranteed. The winner will be whichever political faction can buy or control the Central Election Committe and the Interior Ministry (judges and police) in a nutshell. Sometimes I hate it when I’m right…..but I will continue to predict that chaos will rule supreme after 7 February…….intermingled with serious bribery, corruption, civil unrest and mis-information…….for at least 4 or 5 months. The eventual winner, whoever it may be, may or maynot have been the winner and whomever will take the position…….eventually……..will be considered by half the nation to have got there by foul deeds, even if they have not. It is now completely irrelevant who the winner is or any policy they may have, as none will be able to say they have the mandate of the people……if they care……which I very much doubt. Yes, I know, what else is new! Well dear readers, some of you will have heard of a chap called Mr Lutsenko……but most of you will have heard about him because of alligations of drunken brawls in german airports. Anyway, Mr Lutsenko is a fierce ally to Ms Tymoshenko…….well you would be if you were in charge of the Interior Ministry and therefore the police…….she wouldn’t give that job to just anyone now would she? Anyway, poor old Mr Lutsenko lost his job as Interior Minister yesterday after being voted out of office in the RADA…….much to the annoyance of Ms Tymoshenko of course with an election inside a week. Ukraine’s parliament onJan. 28fired the country’s interior minister, a powerful ally of prime minister and presidential hopeful Yulia Tymoshenko just 10 days before election day. The initiative to fire Yury Lutsenko was raised by the parliamentary faction loyal to Tymoshenko’s opponent in the Feb. 7 vote, Victor Yanukovych. Tymoshenko reacted by appointing Lutsenko to the post of acting interior minister, neutralizing the move. Parliament has no power to fire acting ministers, meaning little has changed. Control over the police could prove decisive if unrest follows the election. Following a vote judged to be fraudulent in 2004, police allowed the Orange Revolution — a huge, peaceful protest on a central square in Kiev. Ralliers forced authorities to cancel vote results in favor of Yanukovych, paving the way for a revote and election of Victor Yushchenko, the outgoing incumbent. Lutsenko said in televised remarks that his initial ouster was a precursor to vote fraud. Today at 12:56 | Reuters Ukrainian Prime Minister Yulia Tymoshenko said on Jan. 28 that her interior minister, sacked by parliament earlier, would continue to head the ministry as its first deputy. Parliament dismissed Yuri Lutsenko in a motion led by the Regions Party of Victor Yanukovych — who will face Tymoshenko in a runoff vote for president on Feb.7. “Today at a government meeting, Lutsenko will be named the first deputy, the acting head and he will head the interior ministry,” she was quoted by local agencies as saying on a campaign trip out of Kyiv. So, the only changes made by this effort in the RADA relate to the poor bugger who has to make a new plaque for Mr Lutsenko’s desk! I am sure number 1 only qualifies for people of a certain age……unless she was judged as hot headed. Ah well, the pervs amongst you will enjoy the link anyway. You are currently browsing the Odessablog's Blog blog archives for January, 2010.